Clinton Township Dental Services | Mark D. Berman, D.D.S. & Associates P.C. Whether this is your child’s first check-up, your own cosmetic dentistry transformation or something else entirely, our dental office has what you need. As a Clinton Township dental office, we pride ourselves on striving for professional, reliable dental services. Let us bring your smile back. We offer a range of dental restoration services to keep your smile looking fantastic. Our award winning dentist specializes in amazing cosmetic dentistry. Let us enhance the appearance of your smile. We offer comfortable and easy Teeth Whitening services. The process is fast, painless, and very effective. Missing teeth are easily replaced with our Dental Implants. 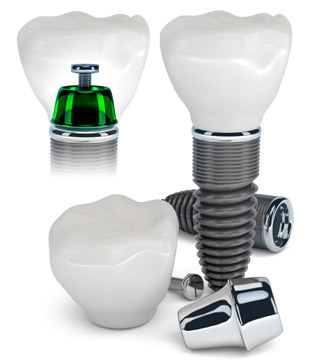 Our implants are high-quality, permanent, comfortable and natural-looking. Whether you want traditional braces or the newer clear aligners technology, we can assist you. We’re very proud to offer warm, friendly and award-winning family dentristry to our patients. Symptoms of periodontal problems include sensitivty, bad breath, bleeding gums and sore teeth. Contact us now to learn about how we can help you. Our award-winning doctor is qualified to perform endodontic procedures. If you need dental assistance, contact us today at Mark D. Berman, D.D.S. & Associates P.C. Some patients may experience anxiety during dental procedures. For this reason, we offer a range of safe and comfortable sedation techniques. Wisdom tooth removal is a routine and simple procedure. If you need help, contact us today. We produce reliable appliances for our clients. Contact us today to learn how to protect your smile. Our award winning dentist is here to help you select the perfect denture for you in the case of full or partial tooth loss. Contact us today for more information. This common jaw disorder can be very uncomfortable. Come to us for assistance today.